New York State Governor Andrew M. Cuomo announced the launch of a new multi-media anti-drug campaign featuring two public service announcements now airing on television stations and music streaming services across the state. The campaign was created to warn New York residents about the dangers of synthetic drugs and prescription opioid abuse. This is the latest in the State's multi-pronged effort to combat drug and prescription opioid abuse. Cuomo's first new PSA features young people warning against the serious health dangers of synthetics. In the second PSA a young athlete explains how a sports injury led to his addiction to pain pills with the message: "Don't let addiction sideline your dreams." Both PSAs are airing in October on TV stations across New York. "The PSAs spread the simple message that these drugs are harmful, addictive, and simply not worth it," Governor Cuomo said. "This administration will continue to do everything in its power to combat opioid abuse in New York as well as take on the emerging threat of synthetic drugs in our communities." 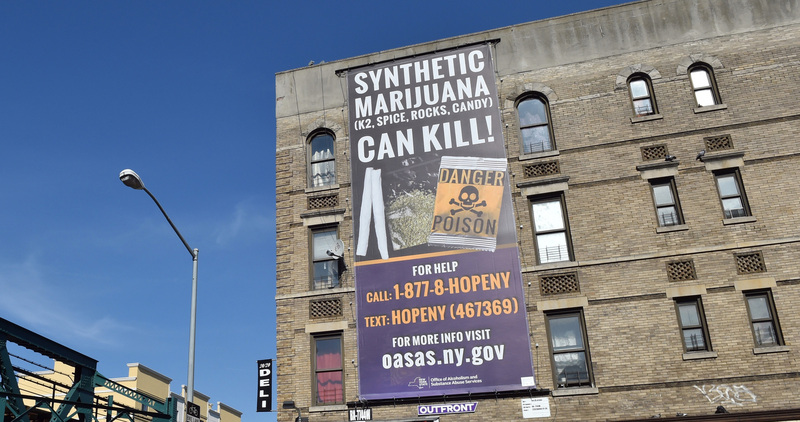 The campaign also includes a 33-foot billboard with the message: "Synthetic marijuana can kill!" Passersby can see the billboard on 167th Street and Southern Boulevard in the Bronx. Similar posters will be posted in subways, bus shelters and other locations in New York City and at select malls around the state. "New York State is at a crossroads," said the New York State Office of Alcoholism and Substance Abuse Services Commissioner Arlene González-Sánchez. "Now is the time to stamp out synthetics and to rid our communities of the harms of heroin and addiction to prescription opioids. These new campaigns bring home the message that help for addiction is available in all areas of our state and recovery from addiction is real and possible." New York State has seen a more than an eightfold increase this year in emergency department visits (4,700 from April 1 - Sept. 3) because of the adverse health effects of synthetic drug use, including psychiatric emergencies, rapid heart rate and death. Samaritan Village has seen demand for its substance abuse treatment services increase by 50% over the past 10 years. A review of the agency's admissions data shows that, increasingly, people are naming heroin and other opiates as their primary drug of abuse - up from 37% in 2003 to 46% in 2013. "The problem of opiates is ongoing," explained Samaritan Village's Assistant Vice President of Residential Services Jim Hollywood. "While the prevalence and formulations may change over time and by community, opiates always seem to find a niche to fit. Today we have a rising concern about heroin and the widespread availability of prescription pain killers." New York State Regional Poison Control Center at 1-800-222-1222. In a medical emergency, call 9-1-1. For New Yorkers struggling with an addiction, or whose loved ones are struggling, can call the State's toll-free, 24-hour, 7-day-a-week HOPEline at 1-877-8-HOPENY (1-877-846-7369) or by texting HOPENY (467369). If you think you or a loved one may be addicted to heroin or other substances, visit Samaritan Village's website to take the Drug Addiction and Alcohol Abuse Self Assessment. Or, visit our Need Help section to review a list of recovery organizations, mutual aid meetings/groups, New York-based treatment providers, or organizations focused on helping a loved one. To learn more about our residential or outpatient treatment services for men, women, veterans, families and adolescents, call 1-800-532-HELP (4357) OR (718) 657-6195. Visit http://combatheroin.ny.gov/, for information about addiction to heroin or prescription painkillers. For tools to use in talking to a young person about preventing alcohol or drug use, visit the State's Talk2Prevent website.